There are many reasons to host your email outside of your web host and there are entire blog posts discusses this topic. If you are hosting your emails externally, you can switch your web hosting provider easily without impacting your business. Futher more there are email hosting providers who provide this service for free. Even though it is ideal to host your emails outside of the web host, it may not be a straight forward task for a first timer. In this post, I will explain the process involved in using Zoho mail and WebFaction. Zoho Mail is free up to 25 users per domain. Setting up the email involves following 5 steps. You can create a free Zoho account from this link. Once you created your account and logged in, you will be taken to the configuration page automatically. If you closed the configuration page accidentally without configuring all the required settings, you can visit the configuration page again using the below url. While all of the settings are not mandatory, you are encouraged to complete at least those highlighted in red boxes. This step is to confirm that you are the owner of the domain name you are trying to set up. You can verify the domain ownership using a cname, text record or via html method. If your DNS hosting provider is listed under the drop down, zoho will give step by step guidelines on the verification procedure. Webfaction is not one of the listed providers; just select others and choose HTML as verification method. Download the ‘verifyforzoho.html’ file and ssh in to your Webfaction account. Go to the root of your application(~/webapps/appname) and key in following commands. Click the verify button in Zoho account configuration page and Zoho should be able to verify the domain now. You can add up to 25 users for free. MX record defines the mail server responsible for handling emails sent to a domain. To configure MX record, go to Webfaction Control Panel > Domains/Website > Domains > Your Domain and configure the settings as below. Sender Policy Framework(SPF) and DomainKeys Identified Mail (DKIM) are mechanisms to prevent email spoofing. Configuring these settings will improve your email delivery rates. If you want to know more about these mechanisms, please refer to this blog post. Again you can verify the setting using the MXToolbox tool. Click on the ‘Proceed to Configure DKIM’ button in Zoho configuration page, and add a selector named zoho. Copy the text value go the selector and go to Webfaction Control Panel > Domains/Website > Domains > Add New Domain and add a new domain called zoho._domainkey.yourdomain. Now go to this new domain and add a TXT record under Other DNS Records section. Paste the DKIM selector value you copied from Zoho here. Click the verify button for the selector in Zoho to verify the DKIM setting. Please note that it may take up to one hour for this settings to get updated. 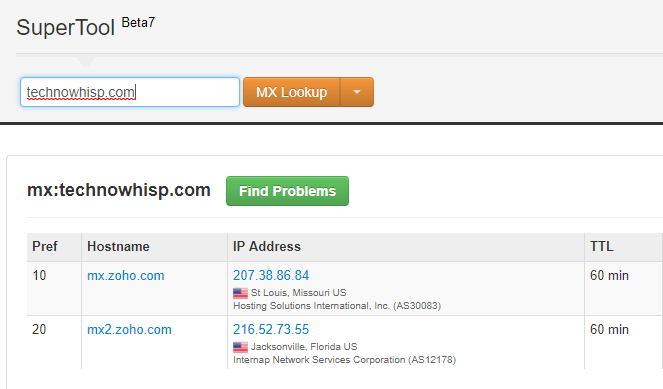 You can use the MXTool box tool to verify the DKIM setting. If you are able to see the DKIM key in MXTool box, but Zoho is not able to verify it, please generate a new text and repeat the process. If you followed the above steps correctly, now you should have a working email server. Try it out by logging in to Zoho mail and sending an email. Full Disclosure: The Webfaction link above contains my affiliate ID and I will receive a small commission for the purchases generated from those links. This will not affect your pricing anyway.